You are here: Home / Banking, Real Estate Finance & Investment / Mortgage Foreclosure | What is a mortgage foreclosure? Mortgage foreclosure is the process of barring, closing out or taking away. A judicial remedy that technically brings a mortgage to an end and vests the mortgagor’s (the borrower’s) estate or interest in land in the mortgagee. A process instigated in the event of a default by the mortgagor. The mortgagee (i.e. the lender or anyone who has acquired the rights of to the mortgage) takes an action to force the mortgagor to repay the outstanding debt, or risk the loss of the mortgaged property. This action may be referred to as ‘barring’ or precluding the mortgagor’s equity of redemption, i.e. barring his right to reclaim the mortgaged property. The termination of a mortgagor’s equity of redemption “without possibility of recall”, 2 Bl Comm 159. Strictly speaking, mortgage foreclosure is the process by which a mortgagee has a right to claim title to the property when a mortgagor is in default in paying the mortgage debt (but not before). It may be distinguished from any other procedure by which the mortgagee may seek to have the property sold and merely lay claim to the proceeds of sale. 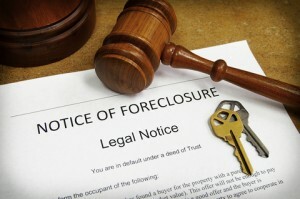 Nonetheless, foreclosure may be used to refer to any process by which the mortgagee seeks to cut off, beyond recall, the mortgagor’s right to the mortgaged property.Thus, foreclosure includes the process by which a mortgagee may seek a sale of the property by recourse to a court order, or by exercising his power of sale; as well as taking possession of the mortgaged property and holding possession for the period allowed for redemption (in the US called ‘foreclosure by entry and possession’ or ‘foreclosure by writ of entry’). In common law, a right to foreclosure arises when the date stipulated for the redemption of the mortgage loan has passed. If there is no specified date for redemption, or if the mortgage provides for repayment of the entire debt on demand, mortgage foreclosure proceedings may be commenced a reasonable time after the mortgagee has demanded repayment (Toms v Wilson (1862) 4 B & S 442, 122 Eng Rep 524). Foreclosure is a remedy available to any legal or equitable mortgagee (whether the original mortgagee or an assignee, and to any first or subsequent mortgagee); but not to a chargee, because a charge does not grant a right to any interest in land. In the US, mortgage foreclosure may take a number of different forms depending on the jurisdiction. It may be: (i) strict foreclosure; (ii) foreclosure by a writ of entry and possession; (iii) foreclosure by action; or (iv) foreclosure under a ‘power of sale’ (55 Am.Jur.2d., Mortgages (Rochester, NY), § 512, p. 187). The American Law Institute, Restatement of the Law of Property, Mortgages (St. Paul, MN: 1997), Ch. 8 Mortgage Foreclosure. Anno 83 ALR4th 243 Foreclosure Forbearance. P. Goldstein & G. Korngold. Real Estate Transactions (4th ed. New York: 2002), Part One, Ch. V, Sec D, ‘Mortgage Default’. G. Lefcoe. Real Estate Transactions (5th ed. Charlottesville, VA: 2005). M.T. Madison & R.M Zinman. Modern Real Estate Financing: A Transactional Approach (Frederick, MD: 1991), pp. 980–1064. National Consumer Law Center®. Foreclosures: Defenses, Workouts and Mortgage Servicing (3rd ed. Boston, MA: 2010). G.S. Nelson & D.A. Whitman. Real Estate Finance Law (4th ed. St. Paul, MN: 2001), Ch. 7 Mortgage Foreclosure. 3 Powell on Real Property (Albany, NY: ©1997- ), §§ 462–71. 12 Thompson on Real Property (2nd ed. Charlottesville, VA: ©1994- ), § 101.04. 55 Am.Jur.2d., Mortgages (Rochester, NY), §§ 512–16, 629–32. 59 Cor.Jur.Sec., Mortgages (St. Paul, MN), §§ 490–558. Cheshire and Burn’s Modern Law of Real Property (17th ed. Oxford: 2006), pp. 775–7, 782. E.H. Burns. Maudsley & Burn’s Land Law: Cases and Materials (8th ed. London: 2004), pp. 852, 895–9, 925. 32 Halsbury’s Laws of England, Mortgage (4th ed. 2005 Reissue), §§ 767–816. M. Beaumont. Effective Mortgage Enforcement (St. Albans, Herts: 1998). Terms in bold, including mortgage foreclosure, power of sale, equity of redemption , the French term hypothèque, and all the related terms are defined and explained in detail in our Encyclopedia of Real Estate Terms, Third Edition; as well as ONLINE.